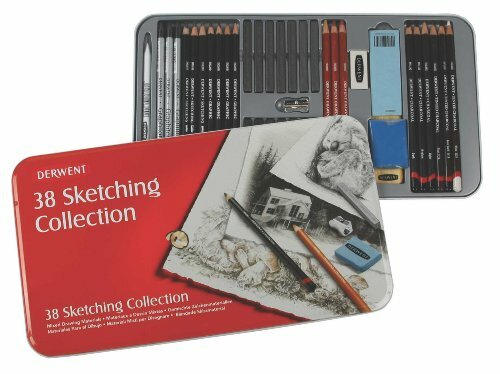 The Derwent sketching collection is an imaginative mix of innovative drawing and sketching media, including Drawing, Pastels and watersoluble Sketching Pencils, plus traditional products like Natural Graphite and Compressed Charcoal Blocks. It’s the ideal gift for the serious drawing student for creating quick freestyle sketches to more advanced drawing projects. A metal tin holds the assortment and other accessories. 38 count set includes: 3 watersoluble graphitone sticks (4B, 2B, HB), 3 graphite blocks (Soft, Medium, Hard), 3 charcoal blocks (Light, Medium, Dark), 2 watersoluble sketching pencils (4B, 8B), 4 graphic pencils (6B, 3B HB, 9B), 3 drawing pencils (Brown Ochre, Venetian Red, Terracotta), 3 tinted charcoal pencils (Peat, Burnt Earth, White), 3 charcoal pencils (Light, Medium, Dark). Since 1832, Derwent has been inspiring amateur and professional artists with an exceptional range of innovative fine art materials. Includes 6 pencils and pencil sharpener. 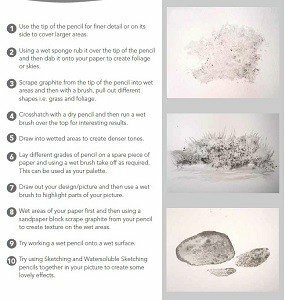 A perfect introduction to sketching. 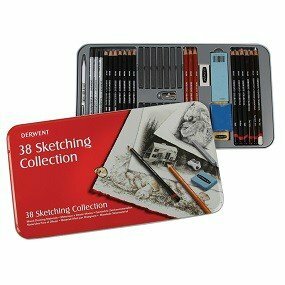 Derwent Sketching Pencil Collection, Wooden Box, 35-Ct.
Assorted drawing and sketching media. 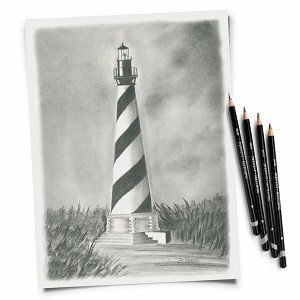 For free flowing quick sketches, with a softer core than Derwent graphics pencils. The perfect setting for drawing and watercolor work. For serious drawing and sketching. If you have any questions about this product by Derwent, contact us by completing and submitting the form below. If you are looking for a specif part number, please include it with your message.